By Avice M. O’Connell, MD, FACR, University of Rochester Medical Center, Rochester, NY. Dr. O’Connell is Director of Women’s Imaging and Associate Professor, Clinical Imaging Sciences, University of Rochester Medical Center, Rochester NY. Ultrasound has multiple uses at various stages in the diagnosis of breast cancer. These include targeted ultrasound for a mammographic finding, targeted ultrasound for a clinical finding, image guidance for biopsy and clip placement, “second look” ultrasound after magnetic resonance imaging (MRI), and preoperative localization for breast conservation surgery. Ultrasound also has proven value inscreening for breast cancer, but for several reasons discussed below, ultrasound screening has limited use and acceptance at this time. Screening ultrasound for breast cancer detection is not in widespread use for several reasons. It is time consuming and highly operator-dependent. It also produces a greater number of false-positive results than mammography. This in turn leads to more biopsies and thereby increased cost. This outcome was demonstrated in preliminary results from the American College of Radiology ImagingNetwork (ACRIN) 6666 trial.1 This trial was designed to provide guidance for women and their doctors on the role of screening ultrasound. It was a multicenter trial with 21 teams in 3 countries. Whole-breast ultrasound was performed on 2800 high-risk women who were followed for 3 years. Preliminary results showed that 40 cancers were diagnosed, and 12 of those were demonstrated by ultrasound alone. 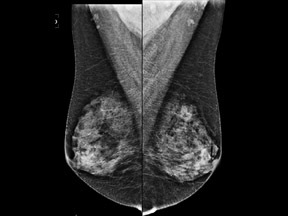 However, the false-positive rate for combined mammographic and ultrasound imaging was 10.4% compared with 4.4% for mammography alone. The classic sonographic characteristics of malignancy include orientation with respect to the chest wall, shape, margin, echogenicity and acoustic transmission. 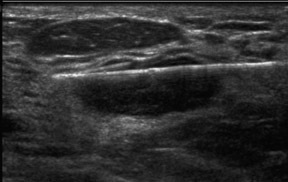 Malignant features include nonparallel orientation, “taller than wide” dimensions, irregular shape or margin, hypoechoic internal echogenicity and posterior acoustic shadowing (Figure 1). 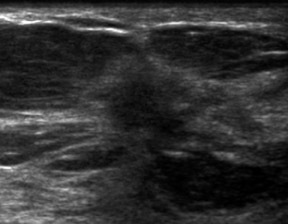 It is also good practice to evaluate the adjacent axilla when a highly suggestive BIRADS 5 lesion is detected and biopsied. 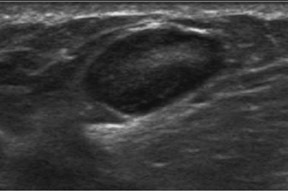 If the axillary node is positive for malignancy, this may avoid the need for sentinel-node biopsy and the resulting risk of lymphedema of the arm. Abnormal lymph nodes may be rounded rather than bean-shaped, have an asymmetrically thickened cortex and exhibit indentations or obliteration of the hilum. They are not necessarily enlarged (Figure 2). 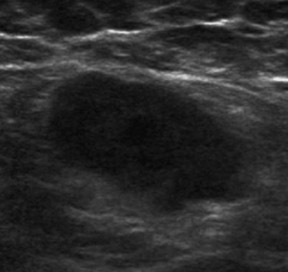 Physically, ultrasound-guided biopsy is easier on the patient. 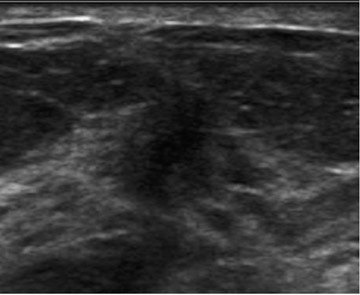 Ultrasound allows direct visualization of the actual biopsy and clip placement. 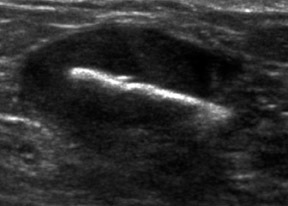 Ultrasound can also detect bleeding and monitor hematoma development immediately. 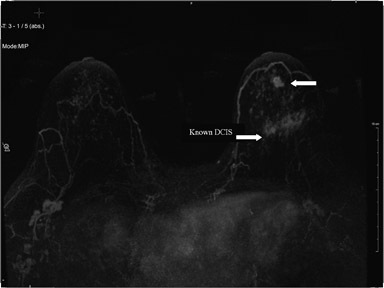 Since most cases of ductal carcinoma in situ (DCIS) are detected due to microcalcifications and only a small percentage manifest as soft-tissue density without calcifications, ultrasound does not play a role in the detection of DCIS. Stereotactic biopsy with specimen radiography is preferred for biopsy of clustered calcifications. 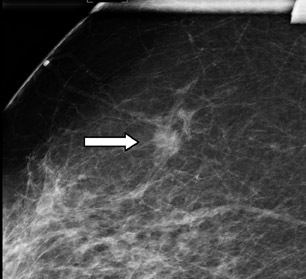 Second-look ultrasound is performed after breast MRI demonstrates an area of enhancement which is occult to mammography (Figure 5). Direct visualization of the target lesion. Obtaining the shortest distance possible from skin to lesion. Visualization of the passage of the needle through the mass followed by wire deployment and needle removal. Occasionally, for a subtle lesion that may not be visible on specimen radiography, a tissue marker clip can be placed in the lesion at the time of localization (Figure 6) for subsequent specimen radiography to confirm removal. Ultrasonographic strain imaging is being evaluated for distinguishing between benign and solid masses. This approach may reduce the number of benign biopsies, together with their cost and morbidity; but according to Burnside et al. “interobserver variability and image quality influence observer performance.”7 There will no doubt be other technical advances and new applications for ultrasound in the breast. Breast ultrasound is highly operator-dependent and requires more physician involvement, input and time than the other breast imaging modalities of mammography and MRI. 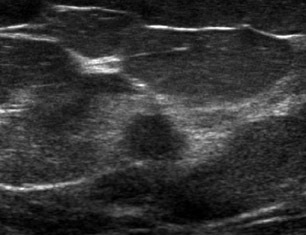 However, ultrasound has unique qualities that make it indispensable and invaluable in the breast imaging armamentarium. Berg W, Blume J, Cormack J, et al. 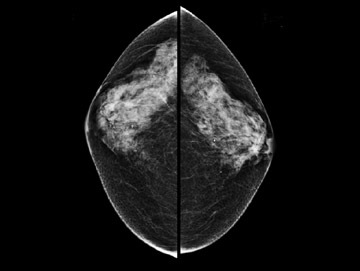 Combined screening with ultrasound and mammography vs. mammography alone in women at elevated risk of breast cancer. JAMA. 2008;299:2151-2163. Raza S, Chikarmane SA, Neilsen SS, et al. BI-RADS 3, 4, and 5 lesions: Value of US in management follow-up and outcome. Radiology. 2008;248: 773-781. Soo M, Rosen EL, Baker JA, et al. 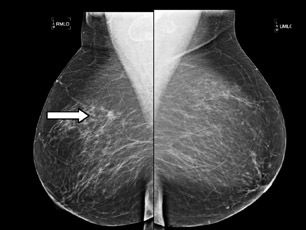 Negative predictive value of sonography with mammography in patients with palpable breast lesions. AJR. 2001; 177:1167-1170. Kaiser J, Helvie MA, Blacklaw RL, et al. 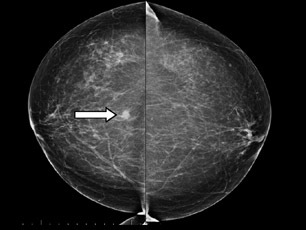 Palpable breast thickening: Role of mammography and US in cancer detection. Radiology. 2002;223:839-844. Mainiero MB, Gareen IF, Bird CE, et al. 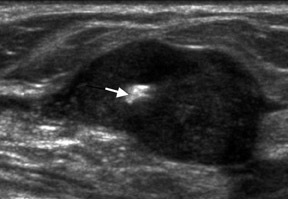 Preferential use of sonographically guided biopsy to minimize patient discomfort and procedure time in a percutaneous image-guided breast biopsy program.J Ultrasound Med. 2002;21:1221-1226. Causer P, Piron CA, Jong RA, Plewes DB. Preliminary in vivo validation of a dedicated breast MRI and sonographic coregistration imaging system. AJR. 2008:191:1203-1207. Burnside E, Hall TJ, Sommer AM, et al. Differentiating benign from malignant solid breast masses with US strain imaging. Radiology. 2007;245:401-410. The many roles of ultrasound in breast malignancy. Appl Radiol.